So, what’s changed (thus far)? Major changes! With any new chef, there’s a shift in philosophy and culture, and the food will follow closely behind. The first week, I got rid of eight things and replaced six. Flatbreads are gone! Haven has a pretty small kitchen, but there’s always been this great potential to do more with what we got. Coming back from my two-year stint at The Ranch, it’s bigger than I remember and there’s some space yet to be explored. This time around, we’re doing things smarter. We know our diners are adventurous, but I don’t want to be experimental..I’m not reinventing the wheel. We shouldn’t have excuses for being a smaller kitchen. Where do you draw inspiration—flipping through Instagram like the rest of us or something else? I get it from everywhere. 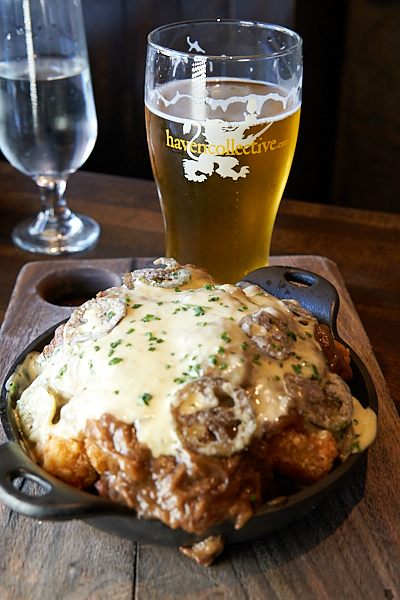 I was in the grocery store with my kids a few weeks ago and got them some tots…I thought that would be great with a cheddar sauce that I did at The Ranch, and boom, our poutine is now tots with that sauce and short rib! We look for inspiration from other gastropubs as well. We’re still seasonal, so a lot of inspiration comes by way of farmers markets. One of my most memorable beer dinners was at Haven a few years ago was one you did with Monkish. 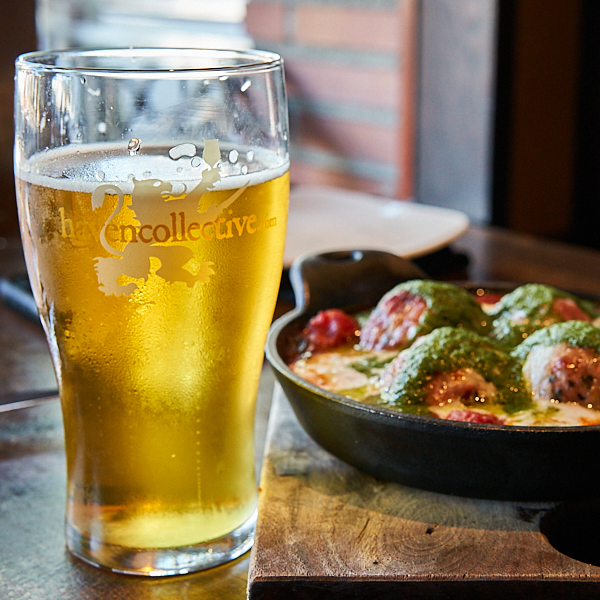 How did you get your beer-pairing prowess? Prior to beer I did wine for years. I’d be doing wine tastings with other chefs, jotting down notes and keeping my mouth shut. When it would come time to pair a dish, I’d go back to my notes, trusting my (own) palate. It’s the same with beer. I’ll often go back to try it a second time to make sure. It’s funny because the times I distrust my palate I always kick myself later. Speaking of big bourbon barrel-aged stouts, what are some good dishes to cook with them? Braise! Anything that calls for red wine, you can fill in a stout. You have to be careful as the hop resins intensify as they cook down. I’d never braise with something like an IPA for that reason. Maybe try coffee stout braised rabbit? I’m drinking Green Cheek’s Brut by the Bay right now. What Haven dish would best pair with it? 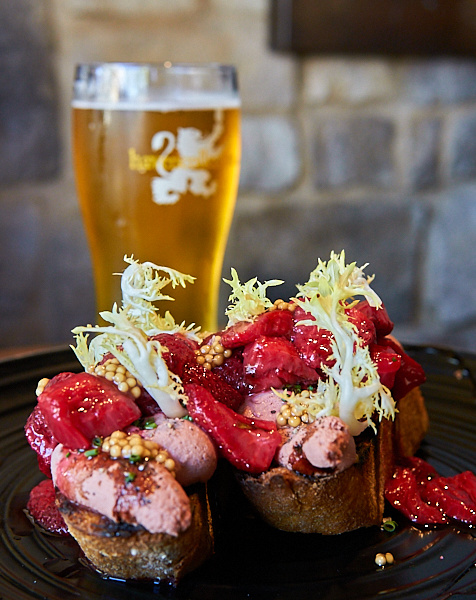 Our new chicken liver toast…For whatever reason, that beer has a big strawberry-like character that matches the Harry’s Berries in the dish. I also suggest the poutine and our new veal and pork meatballs. If you haven’t been to Haven in a while, is it worthy of a fresh look? Absolutely. 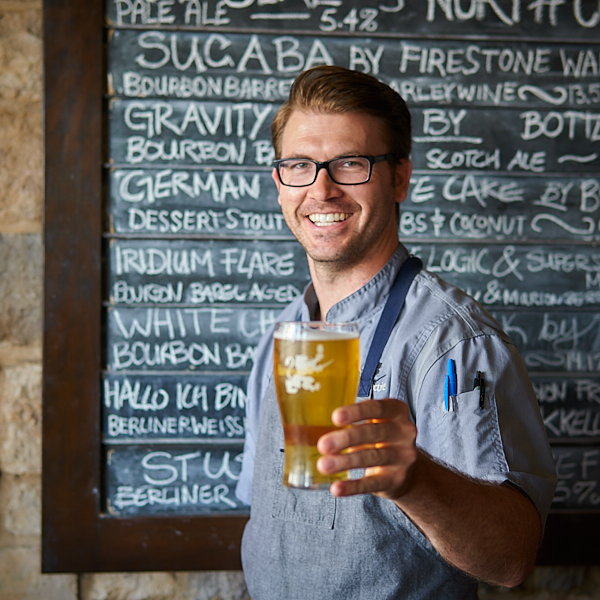 Look for big changes as Haven Gastropub unfolds under chef Craig Brady.